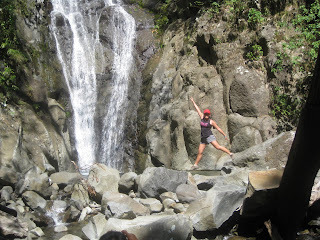 This waterfalls is tucked in one of the most popular trekking destinations in the Philippines, taking 4 hours of hike on a wide trail. 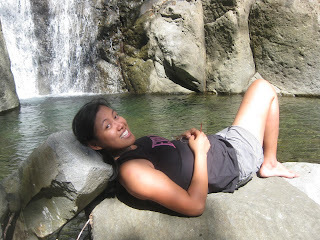 Water in the falls is as cold as ice, very much reminiscent to the coldness of the waters of Tappiyah Falls in Batad. The entrance to the trail is obscured by tall weeds. You have to know it's there to actually venture into it. Once you get pass these obstacles, the trail becomes clearer and wider. The terrain is clean and consists of going up and down the mountain. It's a forgiving trail, one that can serve as an initiation climb for newbies. 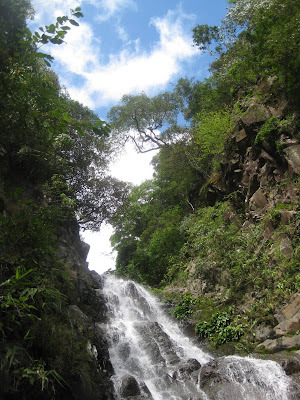 However, about an hour before you reach the waterfalls, trail becomes narrower, passable by one person at a time. You will have to cross some ravines and overcome a lot of boulders. At the end of your trail, a nice reward awaits - serene views, solitude and a bath in a waterfalls with a crystal clear basin. Out of respect to the group who opened this trail and requested to keep this a secret, (at least for now), I will not be able to disclose the location of this place. It’s just not my secret to share. Personally, I am all for sharing any good destination I can discover because that means we can spread the traffic of visitors rather than everyone crowding the same place. 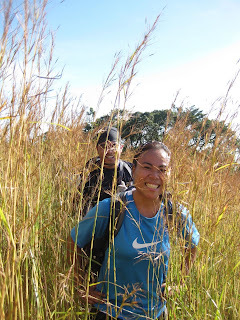 But still, I feel grateful to the group that made the trail passable for a few nosy people like me and the rest of my group.